Zirconium is one of the newest metals to be introduced in the contemporary metals collection. Many are familiar with black tungsten and the problems associated with the tungsten staying black. Zirconium is the answer! Zirconium is a natural element which begins with a silver color. After we mill the style you have selected, we then heat treat the ring. The extreme heat causes oxidation and the ring turns black. The oxidization layer is as hard as sapphire and is there to stay. We can then use our diamond tooling to get back into the ring and create those two-toned designs. 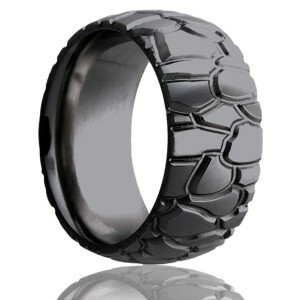 Zirconium is the best option on the market if you are looking for a black ring and want to get creative. Zirconium can be cut with a diamond ring cutter. Apart from the jewelry industry, Zirconium has military purpose.